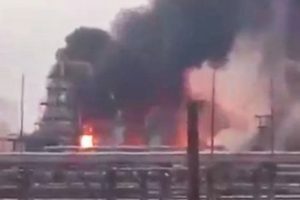 A gas leak on one of ONGC`s unmanned platforms at Bombay High had the Mumbai on its toes on Thursday morning before it was contained by a Navy team. A hydrocarbon-gas leak was detected on one of the unmanned platforms of ONGC in the Bombay High Offshore Development Area early this morning. With the support of the Indian Navy, the ONGC successfully detected the leak and repaired it. No casualty was reported since it was an unmanned platformÂ at Nilam Oil field. In order to expeditiously control the leak, the Navy provided one of its T28 Immediate Support Vessel (ISV) for fast transportation of the repair team of two persons along with equipments from HRA Oil Platform to the leak site. The team successfully contained the leak and were extracted from the site by Navy. The timely intervention of the Navy prevented a potentially hazardous situation. The Navy deploys ISVs to provide security to the Bombay High Offshore Development Area.